This cape is a semi professionnal one, the measurements and the finishing are very similar to the Professional Cape, but its weight is lighter and its handling is easier.The fabrics are cotton with taffeta and the finishing is pasted. The measurements are 225cm X120cm. This cape is a perfect complement to wear with our torero costume.This costume's cape is made of thiner fabric than the authentic red cape or "capote de brega". Its colour is fuxia and the back-hand is yellow.The shape is a cape shape used to bullfight and to evade the bull.Measurements: 150 cm X 73 cm. 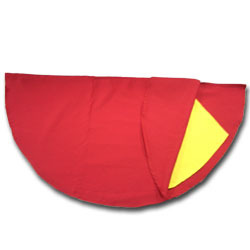 Original Capote (Bullfighter´s Cape) in red on one side and yellow on the other one. It is the perfect accompaniment for a Bullfighter Costume. And, of course, do not forget to get the bullfighter´s hat. Measurements: 150 cm X 70 cm. This torero´s capote (cape) is fuchsia on one side and yellow on the other one. It can be used as an accessory for a torero costume. It is very lightweight, thus its low-cost price. Measurements:150cm X 73cm. The banderillas tercio is one of the most colourful moment of a bullfighting and it happens once the picadores have left the bullring.Usually three pairs of banderillas are placed on each bull.Ref. 1502 - 45cm - 9.00 €Ref. 1501 - 55cm - 10.00 €This product does not admit any change or return. Montera flocada very economic, made from plastic butcovered with a soft materiallikethe skin of peach.d. Montera hat made in felt.